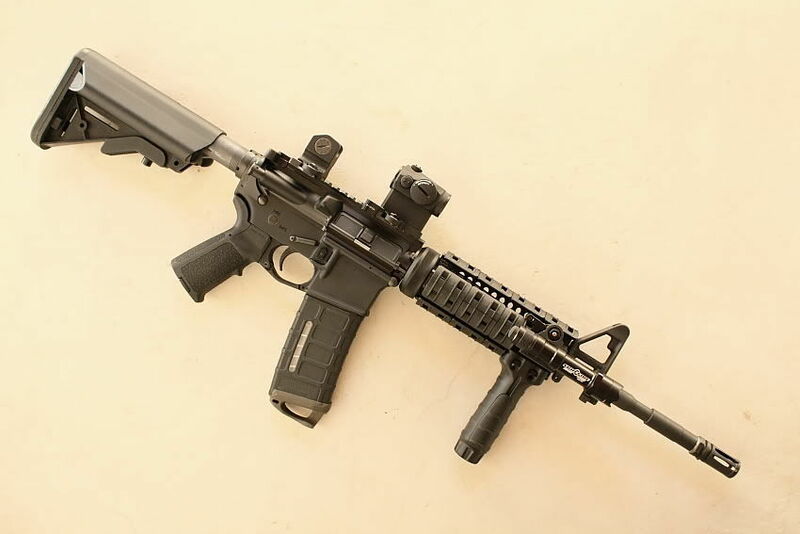 Running the vertical foregrip all the way forward on a carbine length rail system is not anything new and it's not anything I thought up myself. Guys much higher speed than me have been suggesting that I move my vertical foregrip all the way forward since 2003 or 2004. I had tried moving the vertical foregrip all the way forward several times in the past and it just never "felt right". My initial and short term impressions were, I felt as if my support arm was too far out to support the weight of the carbine for long periods of time. I never gave the technique much chance and didn't run the vertical foregrip all the way forward over a prolonged period of time. In late May of 2007, I tried moving the vertical foregrip all the way forward and everything fell into place and the technique finally "clicked". After several years and several attempts I finally figured out why there were so many advantages to having the vertical foregrip all the way forward on a carbine length rail. Think of how things balance and piviot points and hopefully the following will make sense. I have found that the magwell hold or having the vertical foregrip toward the delta ring places the center of gravity too far to the rear. Not a big issue when shooting in a CQB enviornment or only engaging a single target. When engaging targets at further distances or engaging multiple targets I have found this technique doesn't work well for me, and it's hard to keep the gun steady. Think of your carbine like as if it were an old 1800's musket. The stock is in your shoulder, and thus is supported at one end. If you wanted the best control over the musket when moving it quickly from target to target, where would you want to put your support hand? Would you want your support hand in close (near your firing hand), in the middle (dead center) of the musket, or as close as you could get it to the muzzle? Obviously you would want to get the second point of support as close to the muzzle as possible because you will have much better control over the weight if the second point of contact is as close to the other end of the object as possible. Here is an exercise to try to illistrate the point I'm trying to make. This is a dry fire drill, ensure you do the following drill with a complete safe firearm. Keep in mind that the following drill is a target transition drill to illistrate a point. You want to be transitioning targets from left to right and far to near at the same time. You can either set up targets or use a rock, fense posts, etc. as makeshift targets. Pick several objects in your field of view and stagger the distance both from left to right and front to back (example: target #1 @ 50 yards, target #2 @ 350 yards, target number #3 @ 175 yards, target #4 @ 25 yards, etc). You want to keep a lot of distance left to right between the targets. Now take the longest rifle you have avalible to you (it can be a hunting rifle, AR15A2, M1 Garand, etc...the longer the rifle is the better) and put your support hand as close as you can to the firing hand and transition from targets #1 thru #4 as fast as you can. Then transition from targets #4 thru #1 as fast as you can. Do this a couple times in each direction. Now move the support hand the middle of the gun (ie. as close to center as possible) and transition from targets #1 thru #4 and #4 thru #1 as fast as you can. Do this a couple times. Now, move the support hand as far out on the forend as possible and transition from targets #1 through #4 and #4 thru #1 as fast as you can. Do this a couple times (both directions). I'm sure you will find that the further you get the support hand out on the fore end the easier it is to control the gun, the quicker your transitions from one target to another, and when the support hand is in close you tend to "over shoot" your target but when it's further out, you can stop on a dime. Moving the hand or vertical foregrip as close as you can get it to the unsupported end of the gun (ie. the muzzle) provides the best level of support and also helps you drive and control the gun much better. 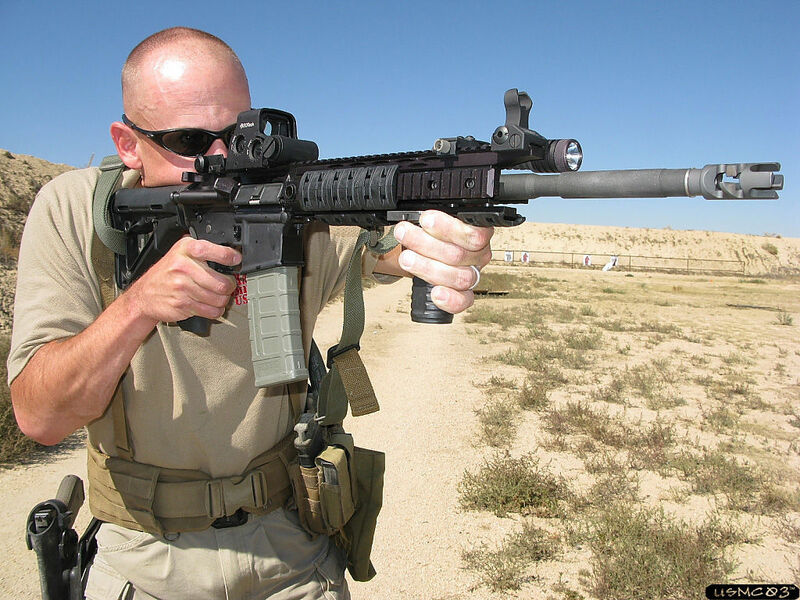 With the vertical foregrip I'm constantly pushing rearward on the vertical foregrip, thus providing constant rearward pressure into my firing side shoulder. While at first having the vertical foregrip all the way forward feels ackward, I find that my support shoulder and arm doesn't fatigue as quickly and I can hold the gun up on target for longer periods of time.